Iqbal Wahhab OBE, award-winning restaurant owner, says he is not interested in charity. Instead, his vision is to employ social enterprise to empower young people in prisons – and he’s doing just that through ground-breaking global initiatives from Southwark to Togo. Bangladeshi-born Iqbal Wahhab is a modern day renaissance man. Educated at the London School of Economics, he has been a national press journalist, entrepreneur of a public relations firm, founding editor of Tandoori Magazine, and is currently the visionary owner of two multi-award winning London restaurants The Cinnamon Club and Roast. Wahhab is not just a successful businessman though, but a social entrepreneur intent on empowering those in poverty and in prison to self-support through enterprise. 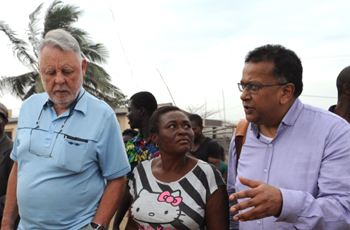 In September, he joined Terry Waite, president of the YMCA’s development branch Y Care, on a journey to Togo to learn about business mentorships in their prisons. Wahhab described the prisons he visited as “horrific...designed for 600 prisoners but filled with 2000.” He said that the regular re-offending rate in Togo is 70%, but for the 350 people taught how to set up their own business upon release, the rate was only 1%. For Wahhab, these statistics are personal stories. Wahhab wants to bring the success of this social entrepreneurship back to the UK by implementing a similar program in local prisons. This program would develop young people with promise by putting them through vocational courses and then send them back to their communities to use their education to improve conditions – or return the money on loan. Wahhab described this system as sustainable because it “makes an investment rather than a donation”. He’s already receiving support for this initiative from social enterprise funds and private investment bankers, and has been contacted to begin a mentoring program with a gang leader in a Southwark prison. Wahhab’s vision is to see the program launched in the next three to six months. Wahhab, as a businessman and humanitarian, sees philanthropy and enterprise as mutually beneficial. He described how his development work brought more business to his restaurants, and how one former prisoner and mentee even became one of his own employees. Wahhab is convinced that entrepreneurship is more effective than charity in lifting people out of poverty, and his own work is a prime example. From Togo to Southwark, Iqbal Wahhab is using his influence in the kitchen and behind bars to empower fellow entrepreneurs.